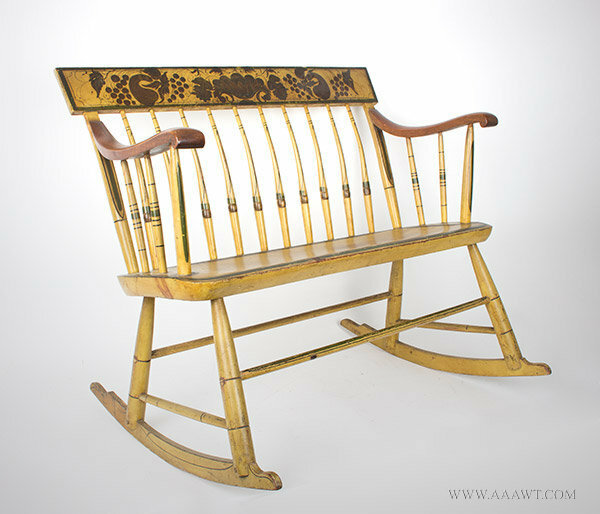 Published within the Decorative Arts Photographic Collection at Winterthur is a Boston-style rocking chair by Ara Howe, retaining Howe’s label; it is 20-years later than the settee, however the front arm posts and the shape of the arms are related. Stamped T.H. BROWN, WARRENTEED, and S.R. 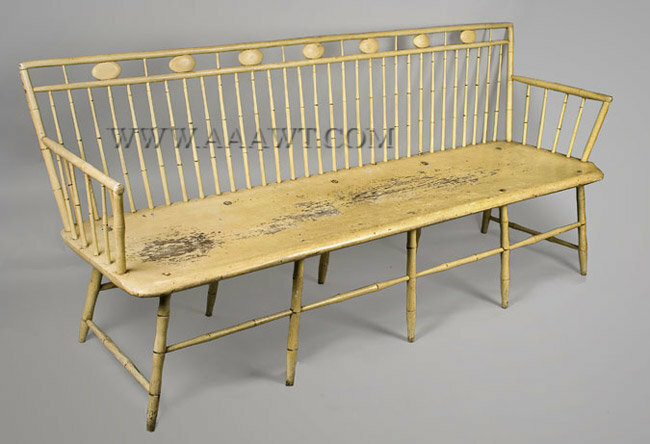 The top-rail with elevated crest panels ornamented by both hand and stenciled decoration above backswept posts and six spindles joined to solid shaped seats raised on faux bamboo turned legs joined by similarly turned box stretchers. 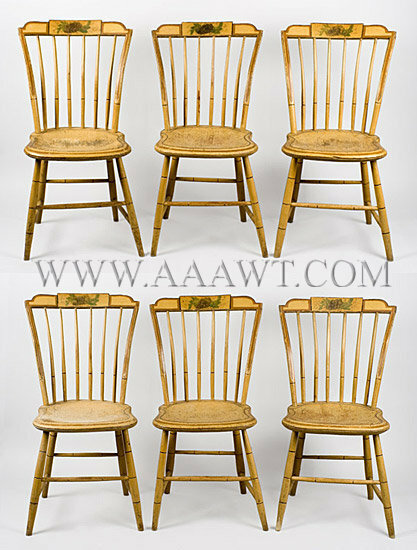 The chairs are in very good original condition including painted surfaces. 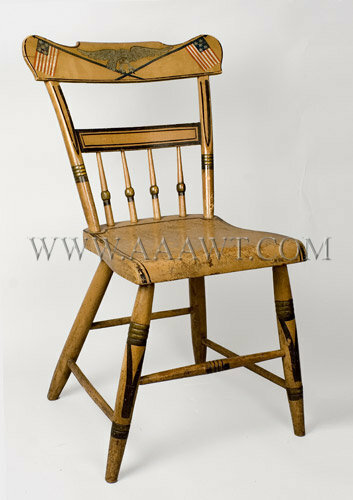 As depicted, minor losses and wear; some minor surface restoration limited to tablets; one spindle has a minor and unseen repair else fine. 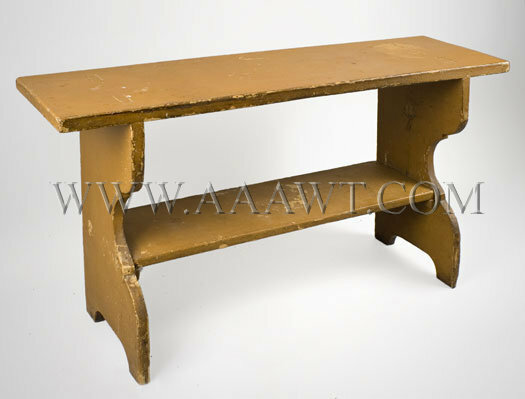 As depicted, the rectangular top raised on shaped sides with cutout feet; sides are tenoned through top and are joined by lower shelf. 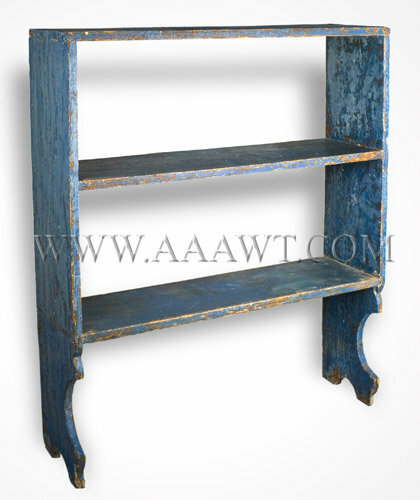 Height: 19.75"; width: 39.25"; depth: 11". 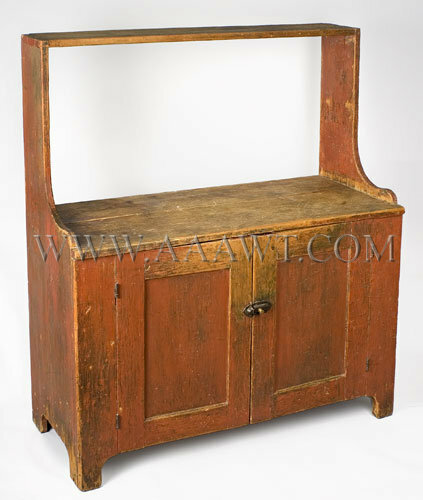 Great utility country piece...bucket bench over 2 paneled doors. 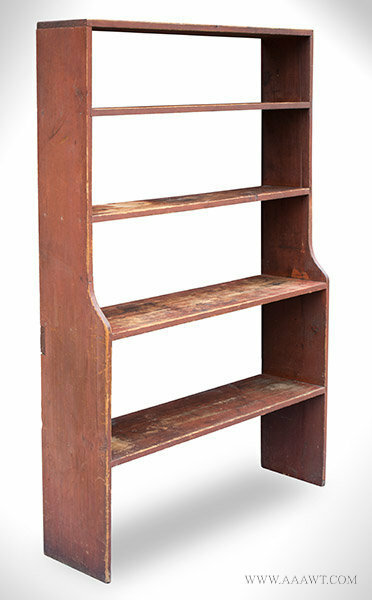 Dimensions: 46.5" overall height, 26.75" height to first shelf, 20" space between shelves, 15.5 by 39.75" lower shelf area, 41.5" overall width, 15.5" overall depth. 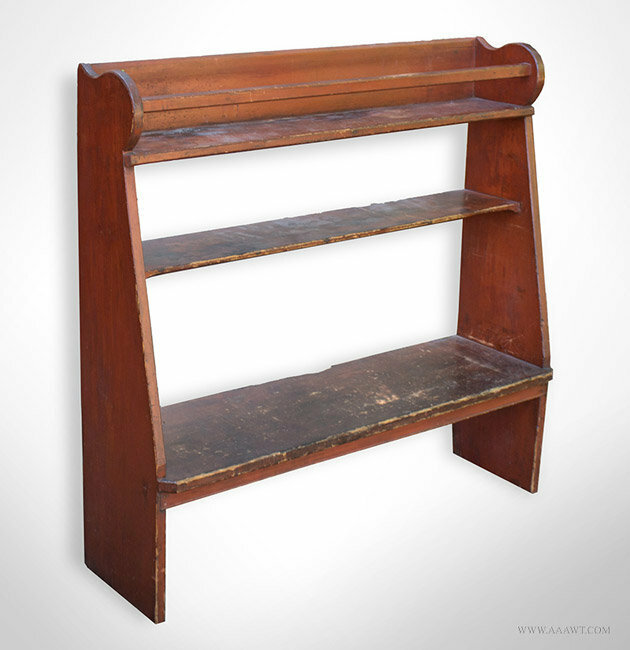 As depicted, cleaned to original blue paint; the shelves are mortised into case...wide dovetail joinery and a terrific base profile. 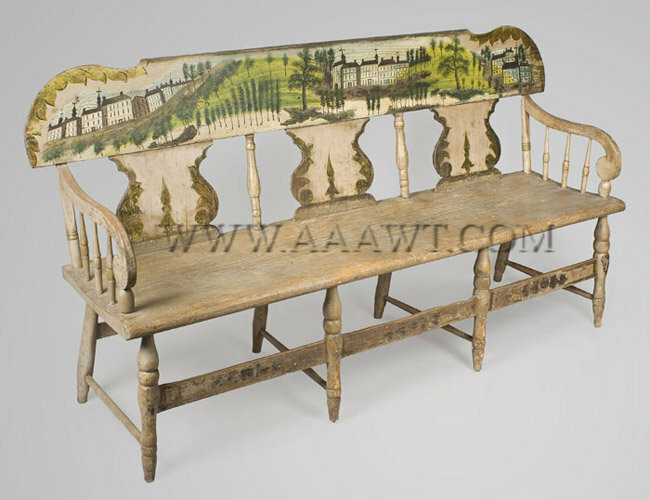 This bench with fielded panels and storage area under seat was grain painted in 19th century. 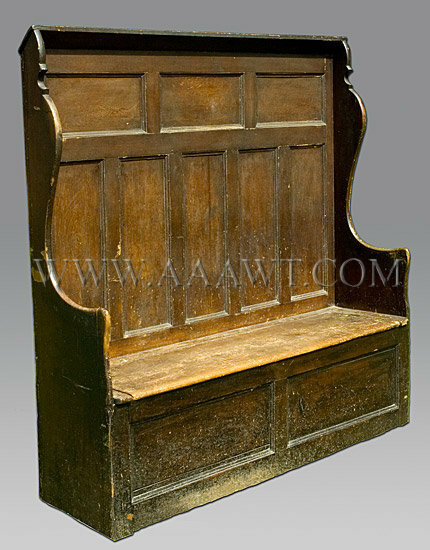 Beautifully executed paneling; shaped sides and in very good condition. The seat which opens to the storage box is missing its hinges. 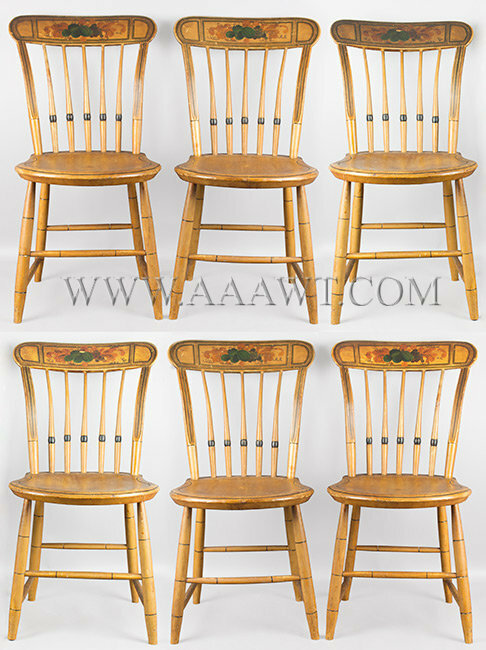 We have had the wood tested by Harry Alden who reports that the bench includes white pine and American red pine. 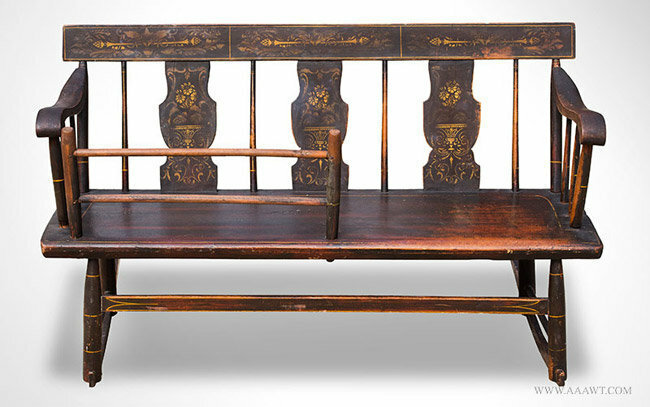 Mixed woods, original painted decoration, 37 x 71.5 x 18"
Later over-paint was removed from the entire surface of the settee, except the front of the crest rail, to reveal the original worn paint. 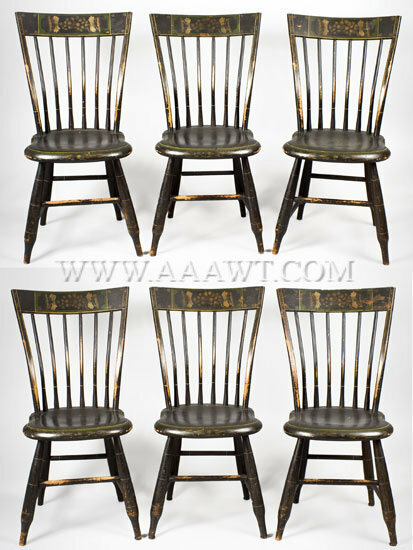 There is some minor scattered in-painting to areas of loss, the left arm, arm support, and spindles under the arm were replaced by Alan Andersen to match the originals on the right side of the settee. 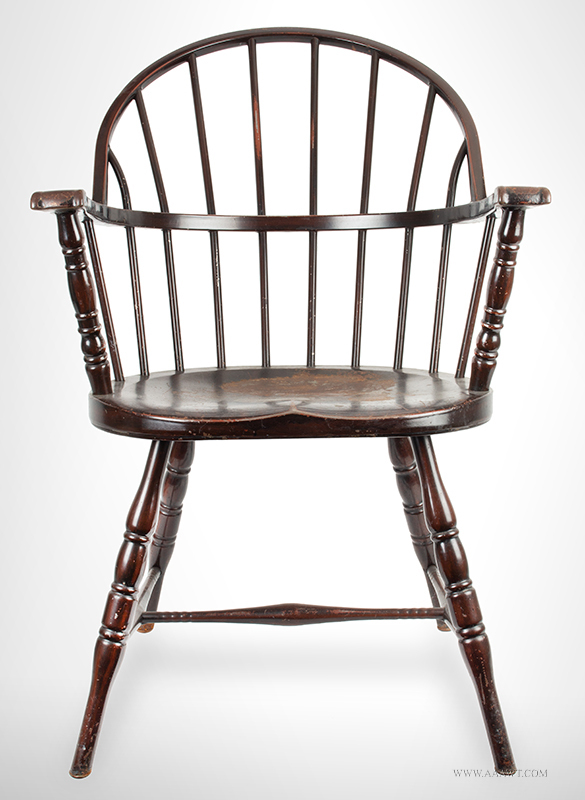 This is one of a small group of tablet-back Pennsylvania settees having related landscape decorated crests, examples of which are illustrated in Dean A. Fales, Jr., American Painted Furniture 1660-1880 (New York, 1972), p. 268; Jean Lipman, Elizabeth V. Warren and Robert Bishop, Young America, A Folk Art History (New York 1986), p. 75, fig. 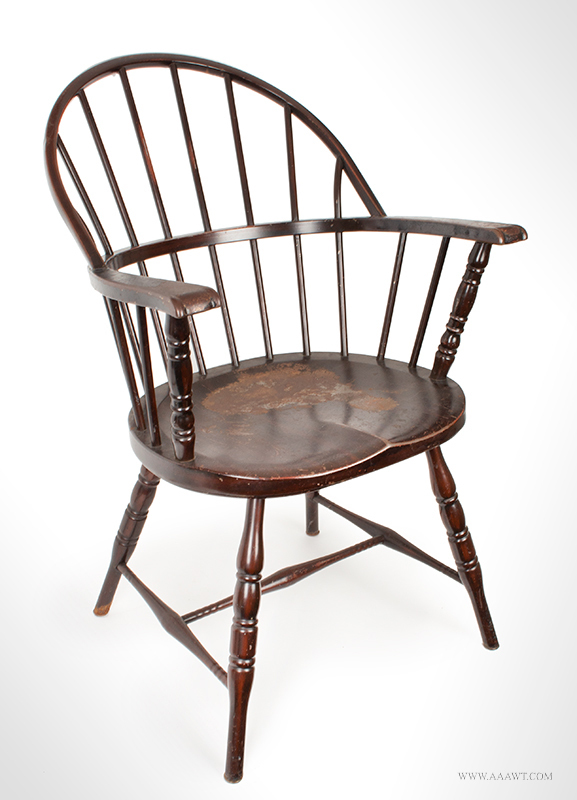 4.18; and Pook and Pook, Inc., "The Pioneer Americana Collection of Dr. & Mrs. Donald A. Shelley," April 20, 2007, lot 301. Pp. 78-79. 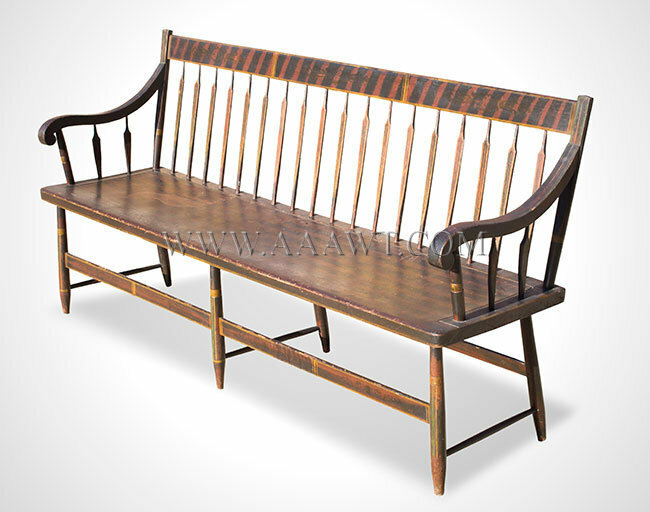 As depicted, delicate yet sturdy bamboo turned rod-back with conforming arms above plank seat with rounded corners raised on base of ten similarly turned legs joined by conforming stretchers. 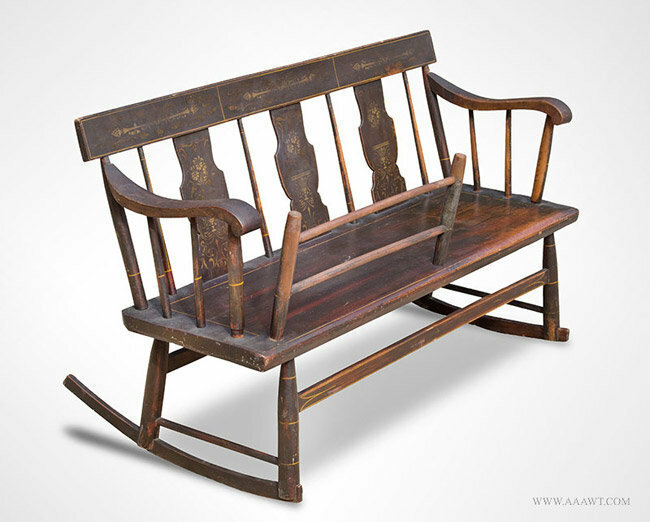 The bench remains in very good condition.